Where are George Soros, Hillary Clinton and Tony Podesta? I have seen a lot of chatter on the Q-Anon and MegaAnon postings at 4chan and 8chan, and have been asked why don’t we follow the goings on, the “clues,” offered, and write about it. While it is true we haven’t detailed their daily and weekly chatter, and won’t, that does not mean we are ignoring it either. Since mid-2017, we have carefully watched, tallied the predictions, balanced the ones that came true out with those that haven’t, along with those that could possibly still happen. See, anyone can anonymously claim they are a secret Intelligence sources offering tidbits and puzzle pieces for everyone else to put together, that doesn’t mean they are, but it doesn’t mean they aren’t either, so unless something can be confirmed, verified or debunked, we simply continue to observe, research and wait. That EO also announced that anyone caught up within those parameters, could have their assets seized immediately and without warning. Corsi believes that many things we have seen and reported on, are indicators that the stage is being set for something huge. Listen below. That Dec. 21, 2017 executive order could potentially cover a whole lot of household names, including people like Hillary and Bill Clinton, the Podesta’s both John and Tony, and the man behind many color revolutions, George Soros. Tony Podesta: Which brings us to the headlined question of where certain individuals are right now, as we have noted many are asking where Tony Podesta has been since he stepped down from the company he founded, The Podesta Group, on the same day that special Counsel Robert Mueller charged former Trump campaign manager Paul Manafort. Trump referenced the apparent scrutiny the Podesta Group is under by Mueller’s team for lobbying work it did in the U.S. on behalf of former Ukranian leader Viktor Yanukovych. The lobbying reportedly resembles the same activity former Trump campaign chairman Paul Manafort was indicted for by the special counsel. The Podesta Group, once headed by brother of former Clinton campaign chairman John Podesta, is likely to close by the end of this year. His brother, Tony Podesta, stepped down from his position at the firm in late October. Excellent question, what has happened to Tony Podesta? A man known for his creepy “child art,” and to which his company was named in the Manafort indictment as “company B,” as one of the firms solicited to lobby on behalf of the Ukranian government. So, Podesta steps down from his position at Podesta group, the groups then announces their closure, to reopen as another entity, then he goes off the radar. A search using a variety of search engines brings up a number of “claims” about Tony Podesta being in Gitmo, arrested, turning states witness and being in protective custody, none of which confirmed and nothing more than rumor, but absolutely nothing offering direct witness sightings, when looking in “news” or just on the “web” option itself. George Soros: Another person that seems to have been strangely quiet lately is George Soros. Liberal billionaire, and the money man behind many of the instances of anti-Trump protests and rioting within the U.S. over the past year, has oddly gone quiet on his social media Twitter account. The last tweet from Soros or whoever runs his Twitter account was on November 26, 2017. Prior to that his account tweeted out messages regularly every month. Some months a dozen, some more, some a few less, but active every month recently except in December and early January. Like with Podesta, there are hyperbolic “claims” around the internet that Soros had a heart attack on Christmas Eve, but nothing in any news agency, or even Hungary news, nor any announcements from any of Soros’ businesses, which is where a press release would generally be generated should something have happened to him health-wise. It was reported in October 2017 that Soros had transferred the bulk of his wealth, some $18 billion to his Open Society Foundations. Is it possible Soros and/or his advisors saw the writing on the wall, or were maybe tipped off, and transferred the bulk of his billions to the society to prevent the U.S. government from freezing or seizing his assets as part of the upcoming EO? Hillary Clinton: While Hillary Clinton’s Twitter page has been active, there is no way of knowing if she still has staff manage her social media as she used to end her personal tweets with “-H” and none of them this past year has included it. 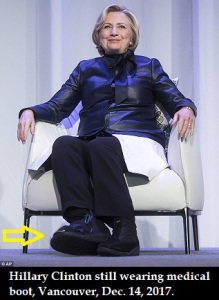 We haven’t seen any public appearances from Clinton since mid-December, where it was noted that she is still wearing a “medical boot.” Clinton started wearing that boot in October when she apparently took a spill, which at first it was reported she hurt her ankle, then she stated she had broken a toe. That “accident” coincidentally happened a day before the huge Uranium One scandal broke out after a blockbuster report at The Hill. Clinton had canceled appearances on her book tour at the time. 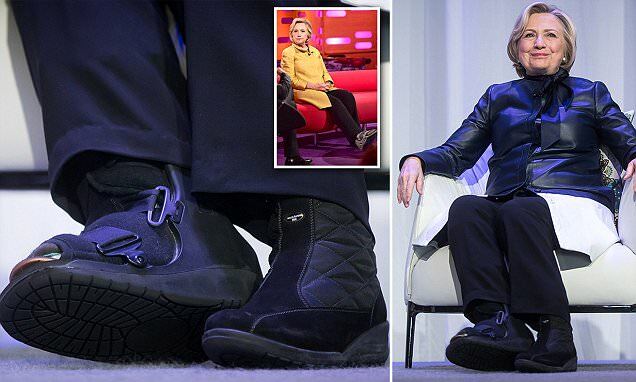 While Clinton’s use of the medical boot for two months from just a broken toe has been the topic of articles, such as this one from Daily Mail, we are noting a number of other politicians seem to be having problems with their leg/foot. That or they have very strange ideas of what is considered a fashion accessory. Then Congresswoman Jackie Speier, the woman that claimed that President Trump was going to fire Robert Mueller on December 22, 2017 (which never happened), and who also happens to be one of the lawmakers on the House Permanent Select Committee on Intelligence that employed Imran Awan who has been federally indicted for federal bank fraud and conspiracy. 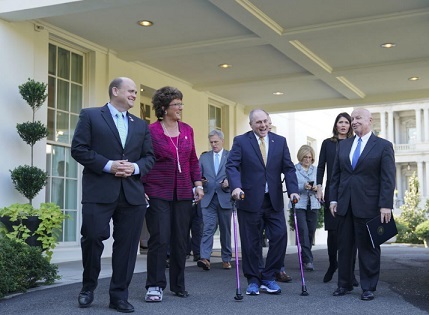 On November 2, 2017, Representative Jackie Walorski, a House Ways and Means member, was also pictured wearing a medical boot, when going to speak to the press after a meeting with President Trump. 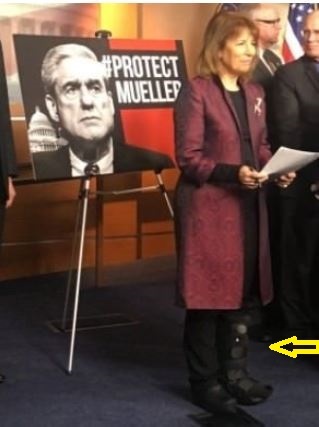 There is a significant amount of chatter across the internet with people speculating these boots are being worn to hide ankle monitors because these people are in legal trouble. This rumor cannot be confirmed and anything other than providing us all with newly taken pictures of both their legs and feet without socks or boots (Think they would do it if we asked? No? Me either), means it won’t be debunked any time soon. There is one rumor I can debunk. 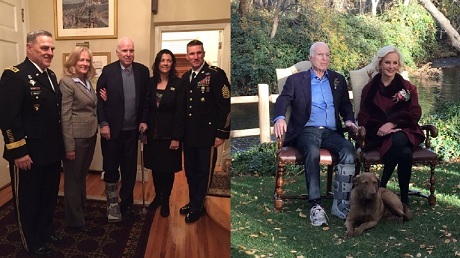 Images are being shared of Chelsea Clinton in a medical boot as well. Those images are real, but they were taken back in 2012. There is a lot going on in January, with the president highlighting Huma Abedin’s crimes, and others, while calling out the “Deep State Justice Department,” and investigations ongoing in both houses of Congress regarding Uranium One, the FBI and DOJ under Obama, along with the ongoing OIG review of the FBI and DOJ actions during the Clinton investigation, and the DOJ now ordering their prosecutors to also review the Clinton evidence and the reasons former FBI director James Comey let Hillary Clinton off regarding her emails and private server usage … so it appears Corsi may be correct, it does seem as if the stage is being set to see another shoe, or perhaps a closet full of them, drop.